Following an ongoing investigation into an Airtime theft at Safaricom that saw the mobile operator nub individuals suspected to have been part of the theft, one Alex Mutuku was arraigned at the Milimani Law courts as one of the masterminds behind the incident and is being charged with manipulating Safaricom’s computer systems. Now it has emerged that the same suspect has another ongoing court case also related to hacking activities. Mutuku is facing criminal charges for being part of a hack into NIC Bank’s system that took place in December, last year. He appeared before a Kenyan court in January to answer to the charges. “I was arrested in early January for allegedly hacking into NIC Bank. The case is ongoing. Now when Safaricom was hacked and it found that I, like other subscribers, had bought the stolen airtime without knowing, they were very quick to arraign me,” says Mutuku in an interview with the Business Daily. Mutuku is claimed to have hacked into the NIC Bank’s customer database with two others and retrieved vital information that was later used to make a payment demand in bitcoin currency, amounting to KSh6.2 Million. Charged with theft, attempted extortion and blackmail, the accused denied the charges and are said to have made threats of publishing the confidential information of customers that they had obtained from the hack into the bank systems. 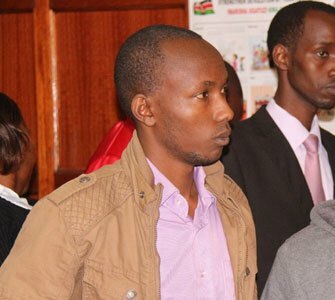 In the Safaricom Airtime theft case, Mutuku is out on a Ksh20,000 bond and is awaiting the court hearing for his case that is scheduled to take place on May 19. The 26-year old is a 2012 graduate from the University of Nairobi with a Bachelor of Information Systems. Investigations into the Airtime theft at Safaricom will see up about 10,000 subscribers of the network answer to having purchased stolen airtime at half the market price.